Whenever I visit the seafood market or the fishmongers I would buy two pounds of fresh, raw, blue coloured prawns as one pound is just not enough for a seafood lover like me! There are many ways to cook fresh prawns still with its shells on. One of the most common and popular ways to cook these prawns is to boil them! This helps to retain their natural sweetness! Compliment the shrimps by dipping them into your favourite sauces. See below for Dipping sauces. This dish brings people together as everyone uses their hands to peel the prawns and this set off a fun and social atmosphere. Plus everyone will be complimenting on how nicely you have cooked the prawns and how succulent they are when you have just simply boiled them. TIP: Keep the prawn liquid as stock for soups! 3 tablespoons light soy sauce, 1 tablespoon lemon juice. 3 tablespoons light soy sauce, 1 tablespoon lemon juice and 2 red Thai chillies. 3 tablespoons light soy sauce and a handful of finely chopped coriander or parsley. 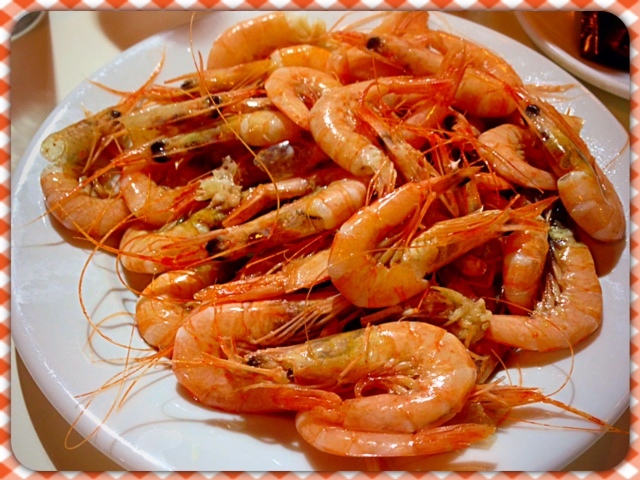 • Wash the prawns under cold running water, deveined the prawns using a sharp knife or a pair of scissors. Rinse again under cold water and set aside. • Bring a pot of hot water to boil on a high heat setting. Add in slices of ginger along with the prawns, with the lid on, boil for 3 minutes until they turn orange/ red colour. Drain into a colander and plate with your chosen dipping sauce.